This page provides an overview of the way fonts are supported in PDF files. It covers the basics about the supported font types, encodings and the ways of enclosing fonts in a PDF, by either embedding or subsetting them. How and why to outline fonts is discussed. Some general recommendations about font handling can be found at the bottom of this page. OpenType: From PDF 1.6 onwards, OpenType fonts can be stored directly in a PDF file. Within an OpenType font the character shapes or glyphs can be encoding using either TrueType or Type 1. That means PDF production tools can embed an OpenType font by taking it apart, copying either the TrueType or the CFF (Type 1) glyphs and embedding those in the PDF in their original/old style format. This was common practice with applications like Acrobat or InDesign before PDF 1.6 was released. Some tools still do this today because it leads to a smaller PDF file if none of the extra features in OpenType are required. Subsetting – Only those characters that are actually used in the layout are stored in the PDF. If the “$” character doesn’t appear anywhere in the text, that character is not included in the font. This means that PDF files with subsetted fonts are smaller than PDF files with embedded fonts. For subsetted fonts, the font name is preceded by 6 random characters and a plus sign. Keep in mind that font foundries can forbid font embedding for certain typefaces through their end user license agreement. In TrueType and OpenType fonts, they can add this restriction in the font data. Applications that properly honor the licensing policy of such a font will not embed it in a PDF. Only a few type foundries actually release fonts with such severe restrictions, but they do exist. A custom encoding can be used by defining a ‘Differences Array’. Which fonts are used in a PDF? There are several ways in which you can get a list of all of the fonts that are used within a PDF file using Adobe Acrobat or Adobe Reader. Adobe Acrobat and Adobe Reader have a Fonts tab in the Document Properties window (File > Properties). Earlier versions would only show the fonts from the active page. I do not know if this is still true for newer releases. The preflight engine in recent versions of Adobe Acrobat Professional is capable of providing a more detailed list of all of the fonts that are used in a PDF. To get an extensive overview of all the fonts used in a document, select Create Inventory in the Options drop-down list of the Acrobat 9 Professional Preflight tool. 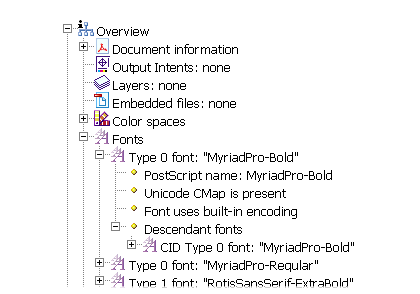 The Font inventory does not only list all of the fonts but even all the glyphs that are used within the PDF. Below is an example of the level of detail. Obviously there are other tools that can provide an overview of all fonts, such as for instance the Enfocus PitStop plug-in. Some applications such as Adobe InDesign automatically embed all fonts when pages are exported to PDF. From Acrobat 4.x onwards, there is no problem embedding the above 14 fonts. In fact it is a good idea to actually always embed these fonts as well. Instead, we got another restriction: if the licensing policy of a TrueType forbids the font to be included in a file, Distiller 4 and later will respect this restriction and will not embed the font. It reduces the size of a PDF file and can be handy if the file size is really crucial, for instance for PDF files that will be downloaded from the web. RIPs will always use a subsetted font, even if the full font is already available on the RIP. This way text reflows caused by differences between fonts can be avoided. Merging two files that contain a different subset of the same font can lead to missing or swapped characters. Older PDF applications can suffer from this. Most of these bugs have been fixed in more recent versions. Sometimes it can be practical to convert all fonts within a PDF to outlines. This way the text in the PDF is ‘locked down’ and will not be output differently by a RIP because of some weird font behavior. You should be aware that outlining fonts affects the quality of the type: at smaller type sizes the output quality will be slightly inferior (because font hinting is gone) and small type may also fatten up a little. There is an option to outline all text in the Advanced > Print Production > Flattener Preview option in Acrobat 8 Professional. This will only outline text on pages that have transparency in them so the trick is to add a transparent object to each page (either using a watermark or using PitStop Professional). You can find a discussion and sample screen shots about this trick in this thread. Most fonts are copyrighted, making it illegal to use an extractor. 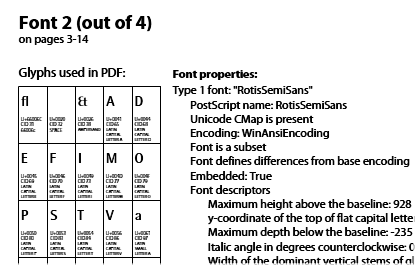 When a font is embedded in a PDF, not all of the font data are included. Obviously the font outline data are included as well as the font width tables. Other information, such as data about ligatures, are irrelevant within the PDF so those data do not get enclosed in a PDF. I am not aware of any font extraction tools but if you come across one, the above reasons should make it clear that these utilities are to be avoided. Always set Distiller to error out when a font is missing. Always embed complete fonts, do not subset fonts. This avoids rare problems when for example putting several pages using the same font in different subsets onto the same plate. Always turn off ‘Use local fonts in Acrobat’ on every machine in your shop. Try to avoid using the TouchUp text edit tool in Acrobat. Remove all fonts from your RIP (except Courier, Helvetica or any other font that your RIP may absolutely require to operate correctly). Use only Adobe PostScript 3 or Harlequin based RIPs or output devices. There are some RIPs/output devices around that have problems handling certain font stuff (e.g. CID fonts as in PDFs produced by InDesign). Check the list of fonts in the resulting PDF (Open in Acrobat Reader then File->Properties->Fonts). If “A Bite” is listed and that font is installed on the computer which is viewing the PDF you are all good. If “A Bite” is not available on the computer which is viewing the PDF you will get a font-substitution which is not what you want. I’m not sure what you can do if “A Bite” is not listed in the list of fonts except ask in the CS4 forums. Hello, I’m a yearbook adviser and I’ve run across a minor problem that I should have an answer for but I don’t. Maybe someone can help me (or maybe this is the wrong forum). I am trying to export from InDesign CS4 a font titled “A bite.” When I attempt to export to PDF, I receive the following message and the font–a bite–is replaced. hi i’m Henry, i have doc file from ms.word 2007 then i save to pdf acrobat x, when i print it there are many font missing,my question is how to know in pdf program thats file is missing or no,so i can check before i print it,thanks send me by email……. I am converting html text to PDF from coldfusion programming language. I do not want to attach Type 1 font. I want to embed font which is used in html text but it attach some default font. These fonts are attached by default. Is there any way to exclude type 1 and embed font not attach. Definitely coming back to read more. I use the edit object tool, hiselect a whole page or just the parts I want to edit, right click>edit object (I’ve already set up Illustrator in the preferences)and Illustrator opens automatically with my selected stuff>edit it in Illustrator, save and it is automatically saved into the pdf, close Illustrator and the changes have been saved in the pdf. If you edit the whole page, you can do a save as an Illustrator file. Do a Find Font and replace the missing fonts with fonts on your system. Love it! We have just had a client come in with a PDF and a TTF font, and she said we should be able to ‘import’ the font into the PDF (which uses it, but the properties say it is not embedded). However, I have never come across this before – a PDF is a PDF (although I am aware Macs & PCs will display & print them differently at times, apparently). Has anyone else encountered this ability? Hi, nice post do you have. thanks for sharing. btw, can you tell me what kind of font do you use here in your site? Hi, I’ve created a pdf form but cannot allocate a specific font to the text fields because the font license wont allow me to embed it. The fonts are laegally bought. Is there a way around this? Peter, there is no legal way to fully embed a licensed font into a PDF, which is what you would need since it’s called for in a form field which could contain any text. You purchasing the font gives YOU permission to use it, not whomever comes across the PDF. I can specify an installed licensed font for a form field, but Acrobat Pro 9 gives me a large warning message. If the users that you distribute your PDF to have the licensed font installed, the text will render as expected. If the licensed font is not installed the rendering tool (for example, Adobe Reader) will substitute another font. If you’d like additional licensing, please contact me and I can assist you. This didn’t help. Simple question: How do you embed a font into a .pdf so the user you’re sending it to can access it? It depends. If a pdf file has been created from a postscript file (print to file) you’re stuffed. If your publishing program has a pdf output preset menu, it should allow you to turn on the “embed fonts” function. If you have an existing pdf you can use the program Pitstop to embed the fonts (Global change, Font, Embed fonts). I´m trying to change a font in a pdf document using the touch up tool. Normally i can choose my font of choice but now i get an error that says the chosen font and the fontcodings are different so the font cannot be changed. PDF’s are already build using variety of fonts. Here I have to choose a font and remove it from the PDF. Suppose the PDF document is having the Time-Bold, Times-BoldItalic, Times-Italic, Times-Roman fonts. In this case, here I want to remove the Times-Italic font only from the PDF. This option is available in the “Enfocus Pitstop” software. By Using this software, at a time we can remove the font in single PDF only and not in a single shot for more no. of PDF. Is there any other option to remove the font from already build PDFs in a single shot for more PDFs. Can you turn a pdf into a usable PDF with fonts. You’ll have to define what you mean by ‘pdf’ and ‘usable pdf with fonts’. Without more specific information nobody can answer your question. Is there anyone help me, how to select and remove a font from PDF. Actually Pitstop is doing it. However, I want to do it in a single shot because I have more PDF to do it. Is there anyone help me. i m using the ARIALUNI font and identity-H pdf encoding to generate marathi text pdf report but it’s not showing marathi text and giving error. could nt load font ARIALUNI.TTF. I tried to do it by installing shivaji01, marathi-lekhani bt its nt working. This is a great summary of how to embed fonts. Pretty much all the info I needed. Thank you for taking the time to detail everything. There doesn’t seem to be a way to define what characters are not present in each document’s subset nor a way to include them without adding extraneous material that might contain the missing characters. Any ideas on how to force them to be merged into a single document. I’m baffled by the geek talk, just want a solution please. I have two files created by GVox MusicTime 4.0.2 and printed to pdf using Sourceforge PDF writer, both generated in the same computer with the same programs, but when I try to merge them using Acrobat 5.0 I get the error message and the documents are not merged. I tried to make pdf documents from musicscore but musical symbols do not appear. yeah, this article was no help at all. All it told me was that the font i’m trying to use is Base 13. Thanks a lot. Very interesting method you have presented here! I am a graphic designer and I work mainly for auto industry. They use special fonts for every icon in the car. I had this problem a few months ago. At that time it was very little information about this subject online. After a lot of researching I have developed a procedure to extract any type of font embedded in any pdf file. I will present my method on my blog on http://pdffontextract.blogspot… so people can use it and solve their problems. Glad to help you guys! I’m trying to upload a pdf into my lulu ebook store and it’s not being accepted because the fonts are not embedded. Can I fix this? I did not create the pdf. There are ways to extract the text in a pdf file and create a word document out of it. Then convert the new word document back into a pdf. Or search on Google for free pdf to word. – The font might be used in an illustration, advert or other page element which was inserted on a page. – There may be a space or other small character such as a dot that accidentally uses an incorrect typeface. A visual check will not reveal this and you will need to doublecheck all the text properties. – Outside of the page in the bleed area there may be elements, such as the crop marks and the document name, which the layout application add. Some designers temporarily put bits of text or logos in the paste board area and afterwards forget to clean this up. Check the pasteboard area as well as the print or export settings. If the above tips don’t help to get rid of the unwanted font, try using a tool like PitStop to delete any elements containing the unwanted font. Quite useful, thank you for the knowledge. It’s useful, but how can I embed a Type1 font programmatically? I am creating an data table in the sql server 2005. i have one pdf file in that all data is in marathi format using CDAC-GISTSurekh font i want to transfer that data into Excel then i will sent to server but there is an problem of font mismatching even i have CDAC-GISTSurekh font . Can Help Me how to i this. I am creating a document for publishing in indesign. I use the character š continuously in the 300 page document. When I export as a pdf sometimes this appears but most often is replaced by an empty rectangle. Would anyone be able to suggest what I am doing wrong or how it is possible to rectify this. I am working with java tech,and i want to display report in pdf format.i want to use Devnagari font(marathi)in report.i have one font “KF_kiran”for devnagari script.but could not display report in this font.plz give me the solution. can we copy fonts from 1 pdf to make another PDF to publish online? Do fonts are copyrighted? for example can we use fonts of article pdf on http://www.sciencedirect.com in designing our own pdf files. Most fonts are indeed copyrighted although there are large libraries of free fonts available on the web. Extracting fonts from a PDF to use them for other projects isn’t only illegal but also very difficult to do (if not impossible). In most PDF files, just a subset of fonts is embedded. Only those characters that are used in the text are also embedded in the PDF. Even if you could extract such a font, you would only have an incomplete typeface with many characters missing. Thank you for this discussion. Can anyone speak to the issue of saving/printing/exporting pdf files from Illustrator, and indesign with regard to embedding/subsetting fonts? I see many students producing their pdfs in many ways, and I get various results. Sometimes the pdfs are still asking for fonts… illustrator and indesign do not have explicit places to specify how fonts are handled when generating pdfs. thank you for your time. i have pdf containing devnagari texts. when i copy these texts from pdf an pest in other application any fonts are not matched. Font encoding seems to be a major issue with Indian Language fonts. Because of the wide range of Devnagari font formats, copying and pasting text seems to be a hit and miss affair. I have no experience with this but possibly a tool such as the one that can be found at http://www.fontsuvidha.com is a solution. We are looking for an Arial Font that is Type 1 postscript with .AFM and .PFB file versions that are embedded and editable. Do you know where I can purchase this font? If anything more than the standard 14 are needed the PDFs have to be embedded with fonts or installed on servers to generate the pdf in that font. In order to use any microsoft or other fonts that are not open source (under the GPL license) you must obtain licensing from Monotype Imaging. I work with developers everyday that solve all the posted questions described here. Remember, using font data outside of your personal workstation without addtional licenseing is IP piracy. This article gives very useful information. Thanks. But I need some detailed information about how acrobat reader processes marathi ( devanagari ) font from Mangal.ttf. actual problem is I am building a demo web application using Java technology. Marathi data is entered database and retrieved back and shown correctly on HTML web pages but when a pdf report is generated, it misspells some half spelled chars like – शिवगंगा महाराष्ट्र are spelled as शविगंगा महाराष्‍ट्‍र ( I have typed it explicitly, actually when I tried to copy from pdf and paste, it pastes correctly in HTML text area / text box like शिवगंगा महाराष्ट्र ). Can anyone expert / experienced programmer guide me please regarding which font / pdfFont, encoding and other parameters I should specify while building pdf. Did you find the solutions. I am looking for the same Please let us know if you got the solutions. This more looks to me an issue related to the PDF Library that you’re using for Server side PDF creation. Few PDF Libraries do not support Unicode properly. So, look into the manual of your PDF Maker Lib that you’re using on your server to create those PDF Reports. In case if you don’t find a correct solution for Unicode PDF creation then you can always include the Devnagari font in your PDF and then use ANSII instead of Unicode. Can you pls forward the code (html webpage to pdf report in marati) that you have developed and do the needful help. We develop software for Indian Languages. There is a rendering problem with PDF created using Mangal and other Unicode fonts. We can give some suggestions that can work. You can contact me and we can take things from there on. Thanks for the outlining in PDF hint. Have been looking for that for a while. Work in Acrobat 7 too it turns out. Acrobat is not only choice for us to change font in pdf file, there is a software name infix pdf editor can take charge of it very well. By using it, you can edit pdf text as you do in word document, replace text, change font type, size and even color. And the most gratified feature is that when you replace text in it, the font type of new text you added will be the same as text around it.